When I was younger I had the privilege of living in a small town called Tangancicuaro, in the state of Michoacán in Mexico... (Best time ever) I grew up pretty much putting "limón, sal y chile" on everything. I would love to go to the Plaza (the little town square) and buy fruit with lots of lemon salt and chili from the usual fruit stands. I knew exactly what I liked from each one, which one had the best papaya, the best chili, and well cleanliness was a must. Everyone was pretty decent, I'm no food inspector but you know what I mean... I'm fine I never got any stomach issues from eating in the streets. 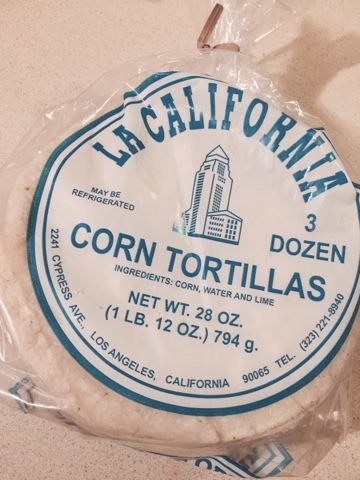 My favorite and go to snack when it's late and I'm hungry and I don't want to make a full on guacamole is this, quick, simple and easy. Haha! Don't laugh at my first food post... I'm cracking up as I even type this. Who knew people need a step by step on my favorite avocado taco. 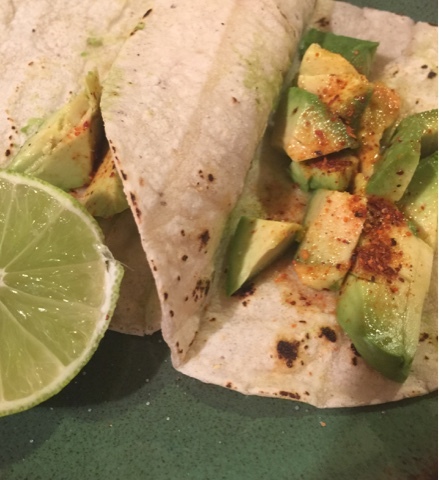 Warm up the tortillas and add the avocado, squeeze some lemon onto it. Then sprinkle the salt and chili and Baaaam! In yo' face! 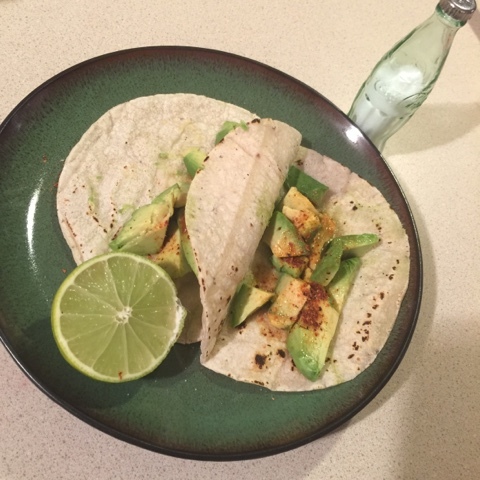 you get this awesome quick taco de aguacate. Lol! Hardest taco you'll ever make right?! LMAO! Yummy! I can eat this forever... The best avocado in my opinion is the Haas avocado. It just has a richer flavor. Not to mention it's a good fat and I will not get into how great avocado is for you. Once I read that it promotes uterus health... See how it's shaped and how there's a seed. Think of that as a baby. Yikes this post got weird... Oops... Gross: TMI! Look it up, I'm not kidding.